In this section we solve differential equations by obtaining a slope field or calculator picture that approximates the general solution. We call the graph of a solution of a d.e. 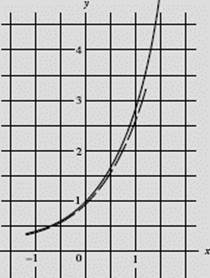 a solution curve. The slope field of a d.e. is based on the fact that the d.e. 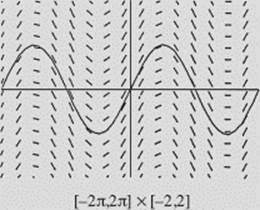 can be interpreted as a statement about the slopes of its solution curves. is a solution. In fact, y = Cex is a solution of the d.e. for every constant C, since y ′ = Cex = y. The d.e. 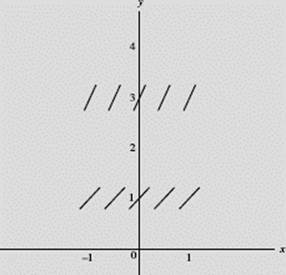 y ′ = y says that, at any point where y = 1, say (0, 1) or (1, 1) or (5, 1), the slope of the solution curve is 1; at any point where y = 3, say (0, 3), (ln 3,3), or (π, 3), the slope equals 3; and so on. Figure N9–1c is the slope field for the d.e. 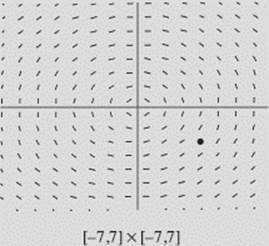 Slopes at many points are represented by small segments of the tangents at those points. The small segments approximate the solution curves. If we start at any point in the slope field and move so that the slope segments are always tangent to our motion, we will trace a solution curve. The slope field, as mentioned above, closely approximates the family of solutions. The slope field for the d.e. is shown in Figure N9–2. 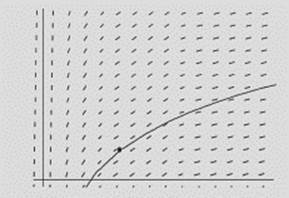 (a) Carefully draw the solution curve that passes through the point (1, 0.5). (b) Find the general solution for the equation. that goes through the point (1, 0.5). (b) Since we already know that, if then we are assured of having found the correct general solution in (a). 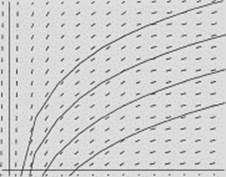 In Figure N9–2b we have drawn several particular solution curves of the given d.e. 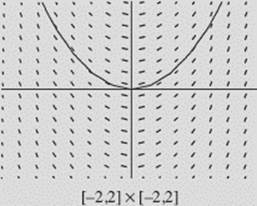 Note that the vertical distance between any pair of curves is constant. 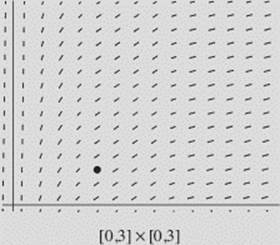 Match each slope field in Figure N9–3 with the proper d.e. from the following set. Find the general solution for each d.e. The particular solution that goes through (0,0) has been sketched in. (A) goes with Figure N9–3c. 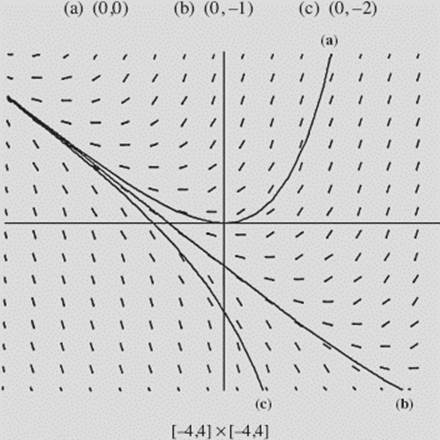 The solution curves in the family y = sin x + C are quite obvious. (B) goes with Figure N9–3a. 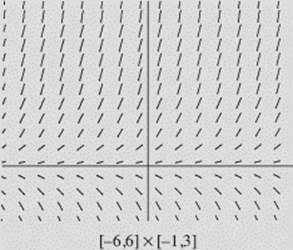 The general solution is the family of parabolas y = x2 + C.
For (C) the slope field is shown in Figure N9–3b. The general solution is the family of cubics y = x3 − 3x + C.
(a) Verify that relations of the form x2 + y2 = r2 are solutions of the d.e. (b) Using the slope field in Figure N9–4 and your answer to (a), find the particular solution to the d.e. given in (a) that contains point (4, −3). (a) By differentiating equation x2 + y2 = r2 implicitly, we get 2x + 2y from which which is the given d.e. (b) x2 + y2 = r2 describes circles centered at the origin. For initial point (4,−3), (4)2 + (−3)2 = 25. So x2 + y2 = 25. However, this is not the particular solution. A particular solution must be differentiable on an interval containing the initial point. This circle is not differentiable at (−5,0) and (5,0). (The d.e. 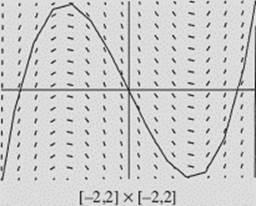 shows undefined when y = 0, and the slope field shows vertical tangents along the x-axis.) Hence, the particular solution includes only the semicircle in quadrants III and IV. 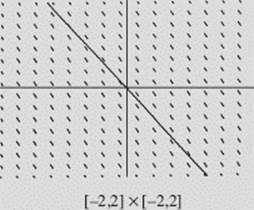 Solving x2 + y2 = 25 for y yields The particular solution through point (4,−3) is with domain −5 < x < 5. We now consider d.e.’s of the form where f (x,y) is an expression in x and y; that is, is an implicitly defined function. 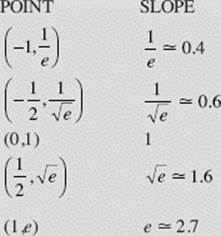 Example 4 illustrates such a differential equation. Here is another example.